Isaac Asimov is potentially the most recognized name in science-fiction literature. 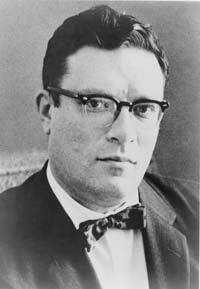 Isaac Asimov was born on January 2, 1920, in Petrovichi, Russia. He was born of humble beginnings as his mother and father were both millers. At the age of three, he immigrated with his parents to the United States. In America, his family came to own and operate a number of candy stores. As a young child, Asimov would read many of the pulp science-fiction magazines that were popular at the time. He was not only drawn to them due to their tales of adventure, he also looked for the science aspect in the stories. At the age of 11, Asimov began to write science-fiction stories of his own. Obviously, his early works were crude tales, but he would start himself down the path of becoming a very prolific and talented author. Asimov became a student at Seth Low Junior College where he initially majored in zoology. Eventually, he changed his major to chemistry and this would lead him down his beloved path of learning science in a formal manner. Asimov is most well known for his hard science-fiction tales and novels. He started writing professionally in 1939 and published an enormous amount of work in the science-fiction genre until 1958. During this 18-year period, he was mainly known for his fiction. However, in 1952, he began to write a great deal of nonfiction science work. He was more than qualified to do this as he held a PhD. As he wrote more and more nonfiction, he crafted less fiction. He only wrote four fiction novels in a 25-year period. Eventually, he returned in 1982, although with much less of a prolific output that had been the case during the 1940s and 1950s. Fittingly, much of his early work was published in the same pulp magazines he read as a young child. There were many major works created by Asimov. Among his most famous works was the Foundation books. The seven books in the series helped establish a great deal of what we know today as the space opera subgenre of science-fiction. Asimov also wrote a brilliant work entitled I, Robot, which forever changed the way many people perceive robots. The work was adapted into an Outer Limits TV episode drawing a great deal of more attention to his material. In writing about robots, Asimov crafted the Three Laws of Robotics which would establish brilliant conventions as to how robots (more or less) should behave in science-fiction. Asimov would pass away in 1992 leaving a legacy of work behind him. His work would go on to inspire many great authors who have followed in his footsteps.